Modern camping has evolved vastly and currently offers an array of different methods in which you can enjoy an outdoor getaway. Camping on top of or adjacent to a vehicle in mounted tents, has become a pretty common affair among avid campers. With the embracement of overlanding and roof top tents, a plethora of innovative variations have hit the market by storm, in the form of truck tents. 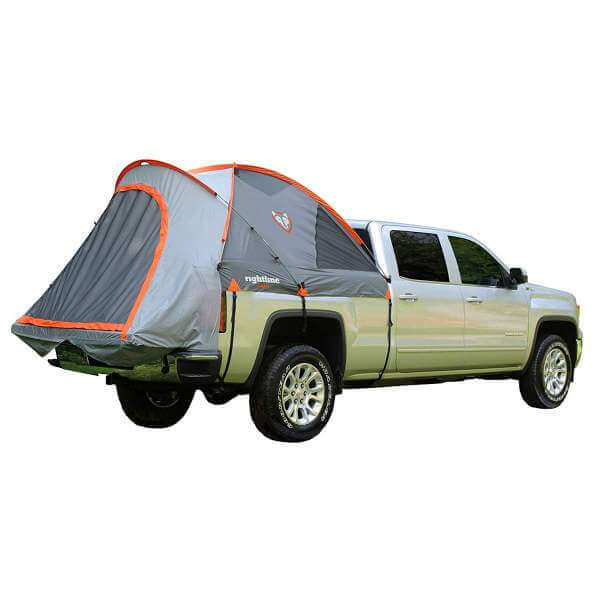 Truck bed tents were promptly designed and manufactured given that the majority of campers do not own Jeep Wranglers and off-road style vehicles. 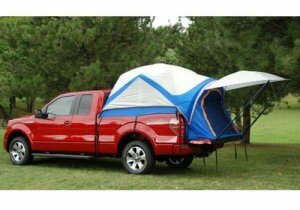 Tents were swiftly manufactured to be compatible for Nissan, Ford, Chevy and Honda pickup trucks, among many other brands. Likewise with all new and successful products, it also comes with a secondary problem, one of which is in the palms of the consumer. Choice. There is an abundance of options on the market, with all major outdoor companies chiming in trying to score their price of the pie. But which are actually good quality and which are best value for money? Are truck bed tents worth it? 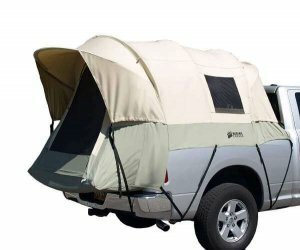 Where can I buy a truck bed tent? 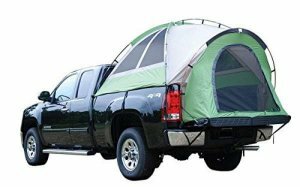 Can I drive with my truck bed tent up? Can a truck bed tent be used on the ground? How do I Measure my Truck Tent Compatibility? 2 of the most popular models are the Napier and Kodiak Canvas, we will into their various tents pros and cons Additionally share some other top quality, lesser known options. Manufactured in a wide range of sizes it can fit a large majority of trucks on the market snugly. The 5ft model slotting nicely into Tacomas, Ridglines, F150, Colorados and other popular models. The rooms are spacious with a slight headroom advantage over the Kodiak Canvas, on the larger 8ft models. Additionally it has an integrated floor on the base of the tent, which is very unique considering the lack of this feature among many of the other models. Like its rivals it also includes a cab access window with meshed windows and side ventilation to aid in air circulation. However they are less in number in comparison to the Kodiak Canvas. A shade awning attachment is evident on the front of the truck tent, providing some shelter and shade during hot and rainy weather. Probably one of the best performing models out there, for this reason it takes poll position. Durable, waterproof and widely compatible, it’s easy to see why it has won the Amazon choice award in this department. The canvas itself is 100% cotton duck which is incredibly durable and impenetrable by water. A benefit of this is that it breathes well, providing decent circulation inside. The numerous windows also create a breeze when needed and there is an access window which can be used to enter the cab. They have also made a mid-sized model now to fit the more narrow trucks like the Tacoma and Dodge 250 among many others. Frame-wise it’s of high quality, the tubular steel frame is 3/4 inches in thickness and surrounds the structure. All in all it utilizes a strong and robust design that can be used in all 4 seasons, although it’s important not to allow snowfall to build up if you are winter camping, it won’t hold significant weight. The Kodiak is one of the top truck tents around and it does perform well with a host of top features. An excellent example of an economical yet highly waterproof truck bed tent. Modestly priced in comparison to Napier and Kodiak models, Rightline’s variation of has performed very well on the market. Manufactured with a waterproof material that includes a resistant membrane, twinned with sealed seams running throughout the tent, it provides a waterproof rating of 2000mm. Which is considered fully protected from rainy weather conditions. Every size holds up to 2 people and comes with a bundle of extras such as rainfly and storage bag, improving the value. A great variety of sizes and they all come in full, mid or compact model designs, giving excellent compatibility. Some other features include interior storage pockets, an attachment to hang a camping light and zippers that glow in darkness. A particularly cool feature that compliments camping in your pickup truck is the sky view mesh. This allows you to drive up on to the hillside and stargaze the night away. The most economically priced model in today’s list. This particular model is a top seller, probably due to the price. It does indeed perform well, but it generally won’t last as long as the other models due to the lower quality materials used in its manufacture. Interestingly it does have a sewn in floor like the Napier model and it additionally comes with shaded windows for privacy. He door is also mesh which will give a certain amount of ventilation throughout the interior. Storage pockets are included in the truck tent also, alongside a hook attachment for a camping lantern. Regarding size and models, there isn’t a great deal of choice here, this model is around 6.5ft. This size will fit models such as Chevy C/K, Chevy Silverado, Dodge Ram, Ford F Series, GMC Sierra, Nissan Titan and Toyota Tundra for example. Generally any bed that measures 76-80 inches long. Be sure to measure with the tailgate closed so you can note the correct dimensions. Lastly it’s worth noting this tent is really easy to set up given the simplicity of the design, much like an Instant Tent or Air Tent for example. In conclusion a great one for first timers or if you just want to try one out before moving onto the more durable models. The second model from Napier is the Backroadz that has some convenient features and compatible with a toolbox or bed-liner. Additionally as it’s a Napier it will come with full floor integration, like the Sportz models. It’s reasonably waterproof with the material used reaching 800mm in rating, due to the polyester taffeta fabric. Albeit not as resistant as the Kodiak or other models, but still enough to withstand your average level of rainfall. It could be reinforced with a weatherproof spray to improve this. The set up isn’t too challenging either. They have color coded all the parts and pieces which speeds up your first set up, which is generally the most demanding stage. Once you’ve got through the first set up and understand the design, it’s pretty easy from there on out. With a variety of models from 5-8 foot, these models fit Nissan, Ford, Chevy trucks easily and many other brands. The Backroadz also has a spacious interior which can easily sleep 2 adults on a standard sized bed, which fits most trucks. There is storage inside also to keep your possessions off the floor, however it’s pretty unequal for both sides. Another option is this seriously cheap model from Guide Gear. Cheap and cheerful it’s a great option to test the water with truck tents or perhaps for your next camping/fishing trip on short notice. Given the price, we won’t expect miracles from it, however it’s a really good seller and the reviews aren’t terrible. In fact they are positive and it seems to be serving the community very well thus far. Employing a simple set up that can be fixed into the truck bed in under 5 minutes. Surprisingly the water rating is actually above that of the Backroadz, at 1500mm. However less than that of the more premium Kodiak and Sportz models. Utilizing a 190T polyester it fairs well in the elements and is one of the lightest tents at 10lbs for the smaller model. So it’s not too stressful on the truck. There are meshed windows which provide some ventilation and also a couple of storage pockets within. Compatible with trucks from Chevy, Ford, GMC, Nissan, Toyota, Honda and more, it’s a versatile and economical choice for a first truck tent. This imported model has some interesting details that we thought were worth a place in our list. The waterproof index is really impressive for a truck tent, it has 2000-4000mm surrounding and a 3000mm rating for the PU coated polyester window cover. The size seems to be one size fits all, from 5-6.7 feet, so there are some adjustments and tweaks that can be made to fit standard sized trucks. However there aren’t any separate larger tents available for the bigger trucks, unfortunately. The value isn’t bad either, it’s moderately priced around $160-$180 and it comes with a small bundle. Carry bag, fiberglass and steel poles. There are also 2 covers for inner and outer sections, additionally some reflective ropes are included. 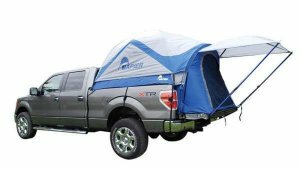 Not a proven truck tent on the market yet, however it definitely has some interesting specifications in comparison to other performing models. This model from Nissan designed for the Titan truck is very sleek. With its 1 color theme in deep blue, it fits perfectly into any Titan bed. In fact they digress that it fits all short bed crew cabs, but it’s probably worth sending a message to Nissan via their profile on the product page to get a concrete answer regarding this. Designed as a Dome shape, this allows the tent to withstand strong winds better than straight walled shelters. It also has a smaller footprint and will take up less space and weight in the back. There is also an external rainfly that will protect the tent during rainfall, however we are unaware of any waterproof rating for this truck tent as it hasn’t been given. Another from Nissan, part of its genuine accessories range, where they manufacture extras to be equipped onto their specific models. 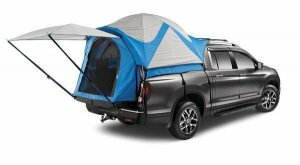 In this case we have a legitimate truck bed tent, with a pleasing color design and robust awning attachment, that is specifically designed for the Nissan Frontier. Rugged material used to provide decent weather protection and all gear and poles are included. It also comes with a free carry bag to keep everything packed safely away when not in use. Weighing around 20 pounds it’s reasonably light for a truck tent and all the poles and parts are color coded, making the set up easy enough to do alone. Additionally if you make mistakes along the way, it’s easy enough to rectify them with the coded directions. Note that the measurements must be done with the tailgate closed to avoid having to send it back due to incorrect lengths. It should be fitting most Frontiers, but do double check before ordering. 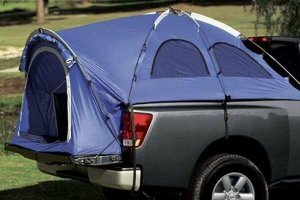 An excellent choice of truck bed tent for 100% compatibility with your Honda Ridgeline vehicle. Made with top quality materials and parts that provides a sustainable and durable tent to fix within the bed. Designed in a sleek silver and blue color theme, it utilizes a waterproof polyester fabric to keep you dry during adverse weather conditions. 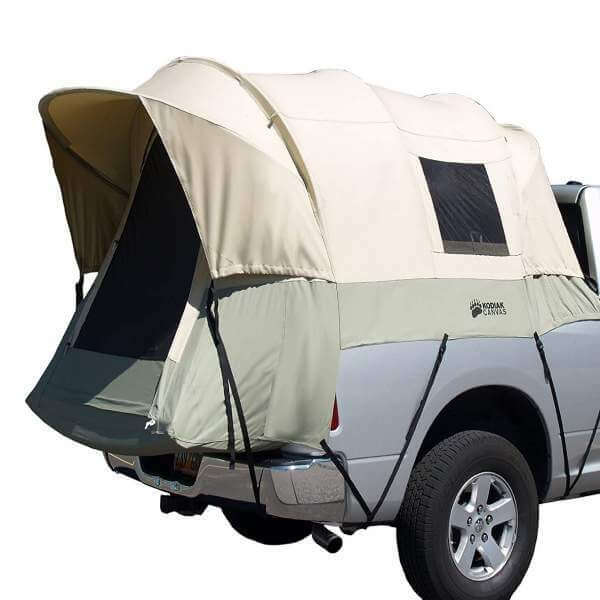 The awning attachment is sturdy, with thick poles mounting the shelter above the tailgate. Providing a decent amount of shade for all situations, like grilling or tailgating. The set up seems to be slightly demanding for the first time, however there are plenty of videos online for a visual guide if you are struggling. Like most vehicle tents, if they are without the color coded set up, they can be difficult. Like all things, practice makes perfect and with a bit of testing at home before your trip, it should become more and more familiar. Note to make sure you call the Honda service line before ordering to clarify your vehicle is compatible with this model. This is a genuine OEM model compatible with the F150 truck. Ranging from 2009-2013 models, for models outside of this range you may need to contact the manufacturers on the product page to double check. It basically mimics that of the Napier Sportz model, however it is has been tweaked to fit the beds of the Ford models mentioned above and is sold directly by Ford themselves. With that being said you can expect to see the same level of quality that we are used to seeing with other Sportz models, such as waterproof fabrics with a repellent membrane within. You can also find the sewn in floor still included in these models, which helps to protect the bed of the truck, also giving you a layer of protection between you hard surface. If you have previously purchased the Sportz truck tent, or perhaps you are considering it, you should know that it has an excellent addition. These are very common among roof top tents, however we are yet to see these among truck bed tents, until now. 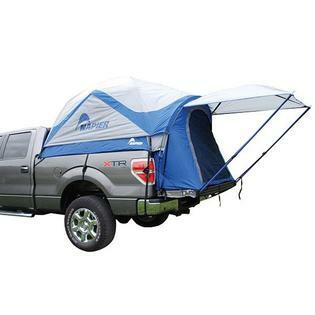 The Sportz Link ground tent is an attachable piece that connects to the truck tent, providing additional space on a ground level. A large door is present on the front of the tent and there are also 3 mesh windows that surround the exterior. This helps to create some air circulation but also stops things like mosquitoes and bugs entering. A rainfly is Included which is important given the windows are meshed, they will need to be covered during rainfall. Size wise its 8 x 8 with a waterproof ground floor, this will stop any morning damp from rising up in the mornings. The tent also comes with a free carry bag that utilizes a stretchy material, useful when packing it back in, they are often a tight squeeze. Overall it’s a great addition if you are in need of some extra space or have friends joining your camping trip. Recommended only for use with Napier products. It would also be compatible with the OEM products that share Napier designs. 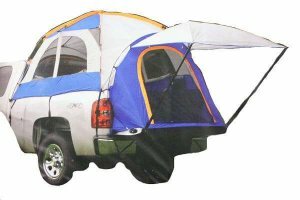 They are 2-3 man tents that slot securely with straps into the bed area of your truck. Allowing you to drive to remote locations and camp out for the night in a waterproof, ventilated and elevated space. Generally $100-$350 in price they offer a unique way to experience your next camping trip. I believe for the price they are worth it. To get a similar experience in other vehicles such as Jeeps, you are looking at $900-$2500 and hard shell roof tents are even more expensive. 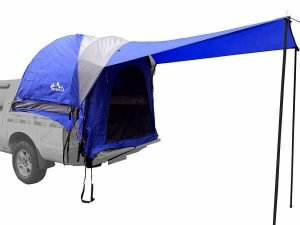 You can get a very similar camping experience with a truck bed tent for $100-$300. 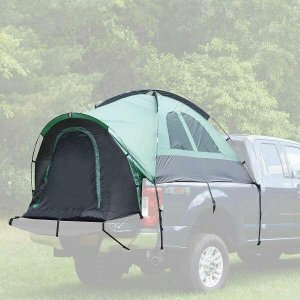 Camping in an elevated position, waterproof, allows remote camping and secures tightly in the truck bed. It’s the one of the most economical methods of vehicle camping. There are various places you can buy them, they are generally sold at most auto-part stores and car accessory and some camping shops. The easiest place to shop for them is probably online, where you can easily compare models and brands and find which one will fit your model of truck. It is strongly recommended that you do not drive with the tent set up in the back. They will not be able to tolerate the wind speeds of a fast moving truck. If you just wanted to move slowly between camping spots or move short distances, you could but at a very slow rolling speed. Not to full effect, no. It would be like using a ground tent on your truck, inefficient. Truck tents are specifically designed to fit into the bed of your truck, thus not suitable for pitching anywhere else. However, there are some options like the Sportz Link Ground Tent attachment which provides a solution to this question. 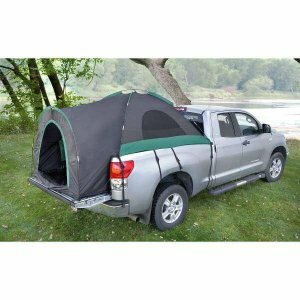 A suitable option that attaches onto your truck tent, you can see our review of this above. For this type you might prefer an SUV style tent. The most important thing to remember when measuring your truck for its bed tent, is to measure with the tailgate closed. We can’t stress this enough and it’s the cause for most order errors. You can consult this great guide on wiki for detailed instructions. 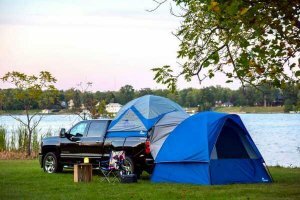 We hope you found this article useful in discovering more about truck bed tents, their uses and which models are worth their salt. The models at the top of the list are the most widely sold and generally are compatible with all models and brands of trucks. Towards the bottom of the list we have the OEM models which are specifically designed and made in partner with the brands themselves, such as Ford, Nissan and Honda etc. This is probably a safer bet if your truck directly matches the requirements for these tents. In conclusion, they are an economical option when compared with roof top tents and more importantly they are compatible with the vehicle you love and have invested in. Try a new way of camping in an elevated position, off the ground and feel free to explore remote areas in your pick up. As we know camping is all about making and enjoying new experiences.